Video Released Of Black Teen's Fatal Shooting By White Chicago Police Officer : The Two-Way Laquan McDonald was shot 16 times in October 2014, after he refused to follow officers' instructions as he walked down a street with a knife. The officer who shot him has been charged with murder. 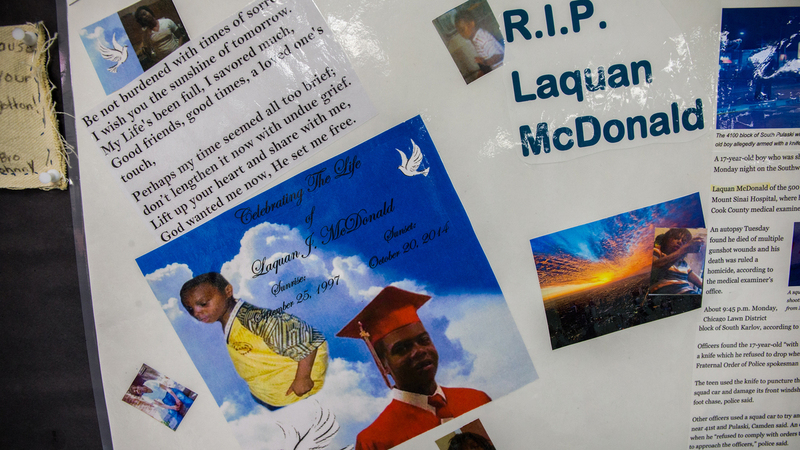 A memorial to Laquan McDonald, 17, is seen in April at the Sullivan House Alternative High School in Chicago. McDonald was shot 16 times by Chicago police Officer Jason Van Dyke in October 2014. Hundreds of protesters took to the streets of Chicago, sometimes weaving in and out of traffic Tuesday night, following the release of a squad car video showing a white police officer shooting a black 17 year old. WBEZ's Yolanda Perdomo tells our newscast unit, some of the protesters chanted "16," which was the number of times Laquan McDonald was shot. More than a year after prosecutors say Chicago police Officer Jason Van Dyke shot and killed Laquan McDonald, 17, city officials have released the dashcam video of the shooting. Van Dyke has been charged with first-degree murder. The video is graphic and may be upsetting to viewers. 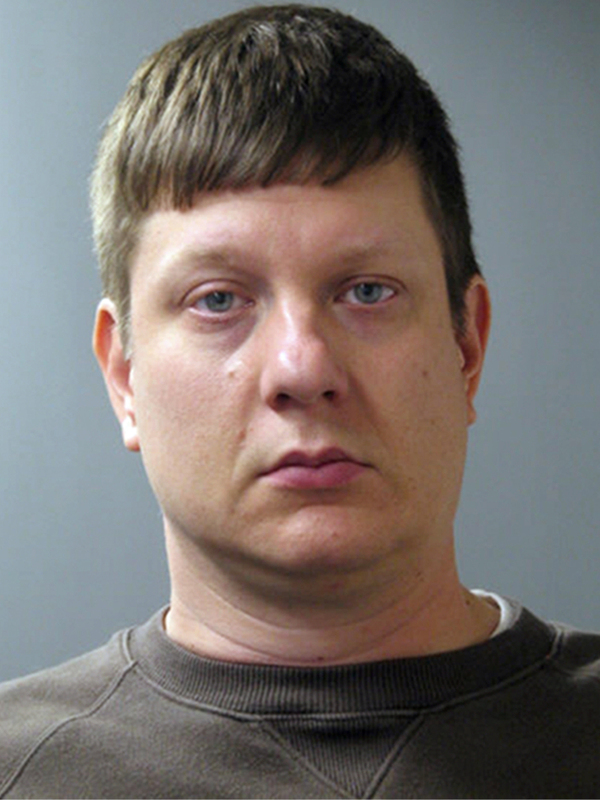 Chicago police Officer Jason Van Dyke, who was charged Tuesday with first-degree murder in the killing of 17-year-old Laquan McDonald. 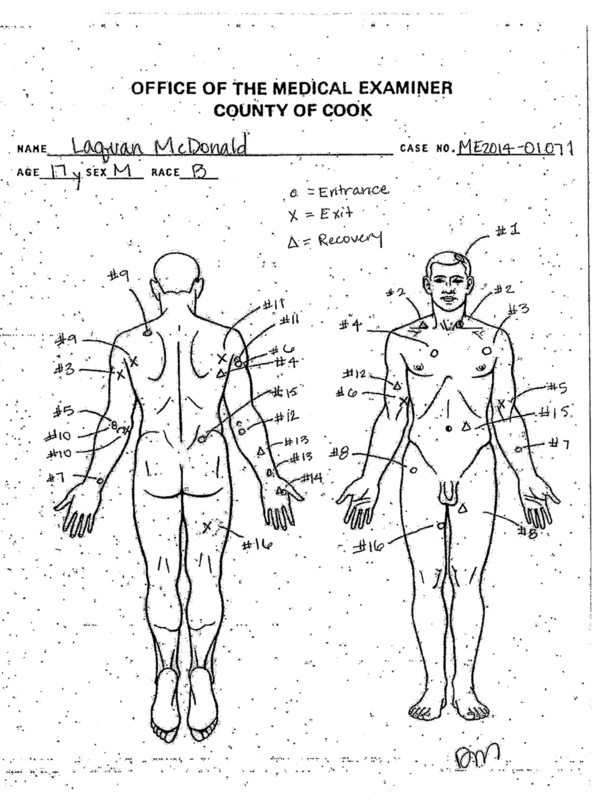 An autopsy diagram provided by the Cook County Medical Examiner's office shows the location of wounds on the body of Laquan McDonald. McDonald was shot 16 times in October 2014. Police say he had refused to follow officers' instructions as he walked down a street with a knife and that he had punctured several cars' tires. An attorney for McDonald's family says he had his back to the officers when he was shot. "Van Dyke turned himself in to authorities this morning," according to a statement from the office of Cook County State's Attorney Anita Alvarez. If convicted, Van Dyke could face a prison sentence of 20 years to life. Noting that a federal investigation is ongoing, Alvarez says that while she had intended to announce the charges against Van Dyke alongside her federal colleagues, the recent court ruling that requires Chicago to release police video of McDonald's death "certainly moved up the timing" of her announcement. But she adds that she had determined her office's charges "weeks ago." Calling the video everything that media stories about it have suggested, Alvarez said, "It is graphic; it is violent; it is chilling." Alvarez says she knows that when the video is released, it will "tear at the heart" of many in Chicago — including McDonald's family. She said she wants people in the city to know that Van Dyke "is being held accountable for his actions." When Van Dyke arrived at the scene that night in October, he was there "for less than 30 seconds before he started shooting," Alvarez says at a news conference Tuesday afternoon. She added that 14-15 seconds passed from the first shot to "clear visual evidence of a final shot" — with McDonald lying on the ground for the bulk of that time. Citing witnesses who said it seemed McDonald was focused on getting away from, rather than confronting, police, Alvarez says that he did not pose a threat of great bodily harm or death. The Chicago Tribune says it's the first time one of the city's officers "has been charged with first-degree murder for an on-duty fatality in nearly 35 years." The announcement comes as many in Chicago have been anxiously awaiting the court-ordered release of a dashcam video of the shooting, worried that it could spark unrest in the city. Ahead of the Wednesday deadline for the footage to be released, Mayor Rahm Emanuel and other community leaders have been calling for calm, while activists are planning protests — including one demonstration that would block a major commercial street on Black Friday. "Officer Jason Van Dyke, who is white, shot McDonald 16 times. He arrived at the scene after other officers had been following the African-American teen as he walked the streets carrying a knife and refusing to follow orders. An autopsy report showed that the hallucinogenic drug PCP was found in McDonald's system, according to the Associated Press. Van Dyke's attorney says the officer feared for his life." In April, Chicago's City Council approved a $5 million settlement with McDonald's family, which had not filed a lawsuit. Emanuel says he hasn't seen the video — but as he called for calm, he also said that from what he has learned about the case, "What happened here is wrong. There is no justification and it's profoundly hideous, in my view." The Chicago Sun-Times recently filled in some of the details about McDonald's life, relaying the story of a young boy who was twice taken out of his mother's care owing to abuse allegations. The newspaper reports that he was a ward of the state when he was killed, and adds that "McDonald was particularly close to his grandmother, Goldie Hunter, and was in her care until she died last year. His daily life seemed to unravel after her death."